I am not a very handy or mechanical person. When my car breaks, I take it to the mechanic, leave it there for a day, and pick it up in the afternoon all fixed. When my dishwasher broke, I bought a new one. When you’re onboard a ship in the middle of the ocean and something breaks, you’re only option is to fix it yourself. Yesterday, we arrived on site and our first operation was to retrieve the existing CORK observatory and thermistor string from the hole. We spent the day lowering the CORK pulling tool to just above the seafloor which is at ~4482 m. We then deployed the camera system to locate Hole 395A and to allow us to latch onto the existing CORK. Unfortunately, the camera system winch encountered problems when it reached ~3700 m below the rig floor—it could not raise the camera system on its own. 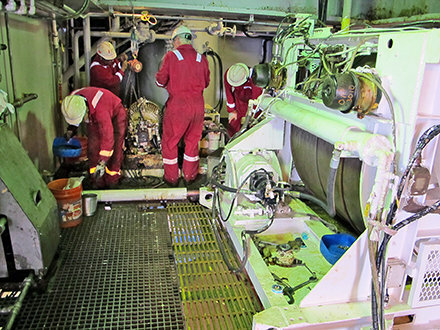 The guys on the rig have been working hard day and night to fix the winch system, because there is no alternative. We have to be able to raise the camera system once we lower it to the seafloor. We have to be able to see the hole to locate the existing CORK and retrieve it. And we have to pull out this CORK to install a new one, which is one of the main science objectives for this cruise. They have spare parts and back-up systems onboard, but if those don’t work, they have to make something from what we’ve already got onboard or find a substitute that will work. It reminds me of the scene from Apollo 13 when something goes wrong on the spacecraft and the support team has to make a square filter fit in a round hole, using only what’s already onboard. It would be great to be able to order a new part when you need it, but we have some fabulous thinkers onboard and it’s amazing to watch them solve the problems that arise with just their mechanical know-how and a bit of creative engineering.